Ken Smith, well-known author of Sales Lessons from the Masters, is an experienced insurance sales and marketing professional. This session will reflect what he has learned (and continues to learn) in his experience selling and training executives in the insurance industry. It is Ken’s belief that sales and success principles are like the laws of nature — they never change! This compelling presentation will illustrate what works and why, and it will be a must-attend session for insurance professionals not only in sales, but also product development, underwriting, and more. Jennifer Howard, Consulting Actuary at Milliman, Inc. 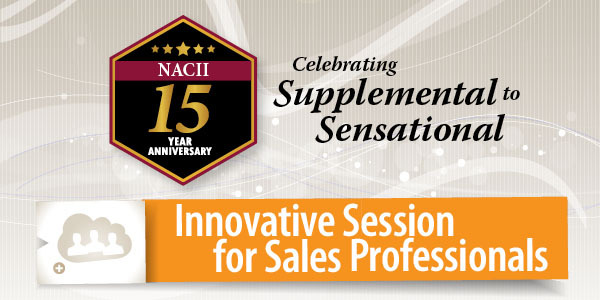 The 2017 NACII Supplemental Benefits Forum provided value for professionals in a variety of roles. Specialists in product development, claims, risk management, underwriting, pricing, sales and distribution, marketing, and administration found significant opportunities for professional growth and networking.